What causes Vitiligo? Precautions to be taken by a vitiligo patient. Above quote aptly describes the day to day struggle that a Vitiligo patient goes through and lives with. Vitiligo – a disease of white patches – is not a physically disabling but a socially disabling disease. Vitiligo affects about 2% of the world population and close to 8% of Indian and Mexican population. Today, on 25th June – World Vitiligo Awareness Day – we, at Life Force Homeopathy take an opportunity to do our bit in generating awareness and hope for better health for the patients suffering with vitiligo. What is Vitiligo and why does it happen? Vitiligo is a non life-threatening disease whereby the skin loses its complexion and is covered with white patches. In most cases even the overlying hair on the patches turn gray. It is a type of an auto-immune disease whereby either there is melanin pigment cell (melanin pigment provide color to the skin) destruction – leading to loss of skin color – causing white patches or defective process of melanin formation – hence no skin color formation. There are multiple causes of Vitiligo which act individually and can be cumulative when present in groups rendering the disease more difficult to treat. Autoimmune trait – Various studies have shown that body’s normal immune cells lose the capability to differentiate between normal melanin cells and harmful agents. Hence they start attacking and destroying melanin pigment forming cells. Immunological factor- Few studies have demonstrated that skin injury releases a certain type of neuropeptide which may damage melanin. Hormonal predispositions – Hormonal affections such as Thyroid Disorders or Adrenal Disorders are roughly present in almost half of the Vitiligo patients indicating a strong association. Research suggests that Vitiligo and Hypothyroidism often are predisposed by the same gene (NALP1). Toxic Overload – Heavy metals such as mercury and lead take a toll on the liver. Hence skin cells come in aid to get rid of the toxic overload by excreting it from skin surface. In return they damage the skin surface preventing it from producing required levels of melanin pigment. Emotional stress – Similar to skin injury, any severe emotional injury can also trigger release of the neuropeptides which can damage melanin. Genetic Tendencies – The familial incidence of 20-30% is observed in the family members. If one or more of the parents have vitiligo, there are more chances of one developing the same, however, it is not a rule. Numerous cases of vitiligo does not have a relevant family history of vitiligo. A study at our center also shows that the patients who have either extensive vitiligo or those developing vitiligo spots on both sides of body (bilateral symmetrical) have a strong genetic element. In other words, it is difficult for any patient to have extensive vitiligo without genetic links. Are there any modifiable factors – Precautions? Avoid tight clothing around waist which may cause pressure effect on skin. Monitoring and maintaining Thyroid hormone levels within normal limits. Avoid fish and sea food as they are polluted with heavy metals especially mercury. Avoid too sour food, such as lemon, oranges, pickles and tamarind as they are found to trigger the autoimmunity. Adequate morning sunlight exposure for 10-15 minutes helps repigmentation. Stress management – especially in young children by explaining them that vitiligo is a benign skin disease. Avoid discussing your child’s vitiligo repeatedly. 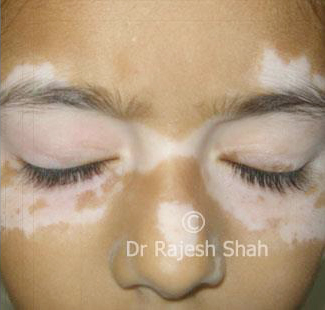 Moreover, avoid negative discussion about leucoderma (vitiligo) during the child’s presence. Examination of the spots is better done when the child is asleep. Do not allow vitiligo to interfere with your child’s joy of living and self esteem. Do not restrict your child from wearing clothes which may expose some white spots on the skin. Encourage your child to continue attending social events, other activities like swimming, hiking, sports, parties, etc. Get in touch with us to benefit from Dr. Rajesh Shah’s research based homeopathy treatment for Vitiligo at Life Force where we have under our treatment over 7500 cases of vitiligo. You can give us a call at +91-22-66888888 or drop an email at info@lifeforce.in or contact us here. Does your child suffer with Vitiligo? A must read message to the parents whose children have Vitiligo. Have Vitiligo? Find your chances of recovery with our Curability test here.